Awards, Galleries, Etc. October 2017 Proud to be part of Clearwater Gallery of Sister's Oregon. March 2016 "Mima" Featured on the cover of Flying Changes Magazine. Premier Equine Magazine of the West Sept. 2014 Featured Artist at the "Draft Horse Classic" in Art at the Classic Grass Valley, Ca. July 2014 "Little Duchess" Best of Show. St. Paul Pro Rodeo Jan. 2014 UCC purchased "Foggy Morning Workout" for their permanent collection. 1100 entries. April 2014 "Rembrandt II" Featured on the cover of Flying Changes Magazine. Nov. 2013 Publicist in Grass Valley, Ca. informed me my painting "Percheron Power" was chosen for the 2014 Draft Horse Classic for their publicity pieces, Billboards, Banners, Programs, Flags, Posters, Clothing, etc. July 2013 "Rembrandt II" Best of show St. Paul Pro Rodeo. April 2013 "Rembrandt I" Chosen for the cover of Flying Changes magazine. Jan. 2013 Featured artist Fisher's Fine Art Gallery, Roseburg, Oregon. July 2012 Best 2 Dimensional artist of the St. Paul Pro Rodeo. Oregon. 2012 "Percheron Power" Featured in Art Horse Magazine finalist book. Yearly international art competition. Dec. 2011 "Percheron Power" is finalist top 40 in the international Equine Art competition Ex Arte Equines 5. Over 1500 entries worldwide. 2005 Featured artist Red Gallery UVARTS Association, Roseburg, Or. I was thrilled to find "Odie". He is the horse I used for "Percheron Power. As he has aged he has lost the majority of his spots. Needless to say he was a very popular horse during this event. My painting "Percheron Power" was chosen for the "Draft Horse Classic" in Grass Valley, Ca. for their 2014 publicity. 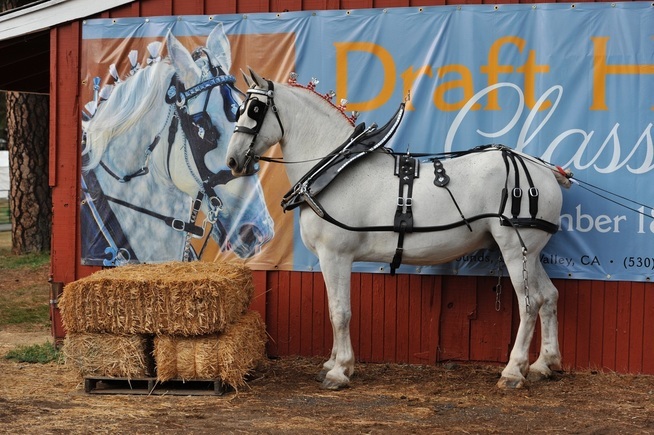 One of the banners thru out the state promoting the Draft Horse Classic. This banner and other's were found all over the fair and along freeways thru out California. "Best of Show". Rembrandt II. St. Paul Rodeo. "Little Duchess" Best two dimensional painting of the St. Paul Rodeo art show.